UPDATE: Autographs for Camren Bicondova as Selina Kyle arrived too late to be included in the pack-out for 2016 Cryptozoic Gotham Season 1. 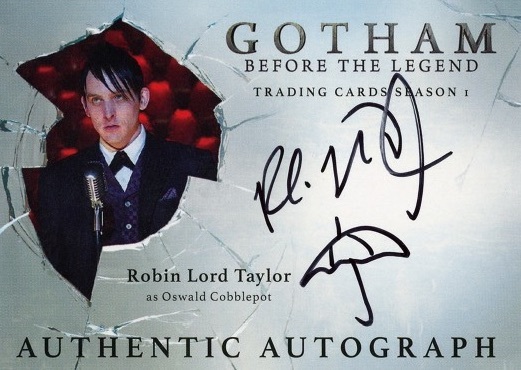 Cryptozoic will make the signed cards available to collectors through contests, social media giveaways, their NPN program, and the Philly Non-Sports Card Show, among other avenues. 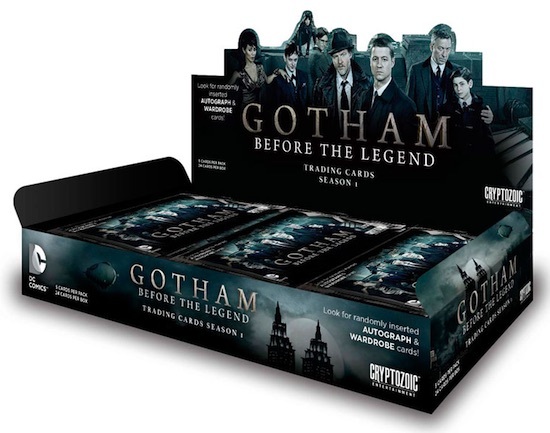 2016 Cryptozoic Gotham Season 1 takes collectors to the dark streets of the comic-based city. 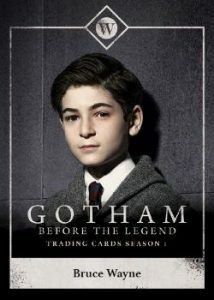 Covering the first season of Gotham, each box includes one autograph and one wardrobe card. 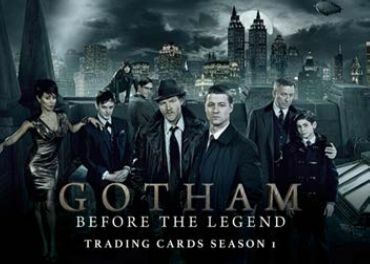 The popular television series provides origin stories for many notable figures in the DC Comics Universe, boasting the tagline "Before the Legend." 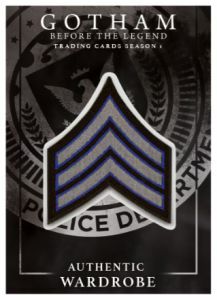 The 72-card base set highlights key moments from the first season, touching on each of the 22 episodes. 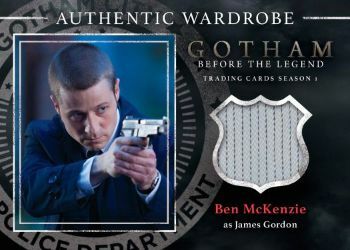 Premium inserts in 2016 Cryptozoic Gotham Season 1 include Autographs (1:24 packs), Wardrobe cards (1:24 packs) and Dual Wardrobe cards for the main cast and guest stars. 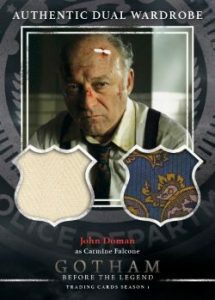 Wardrobe cards feature production-used relic pieces. Although the full list of signers will not be provided until the release date gets closer, the series features several notable options that would likely please collectors. 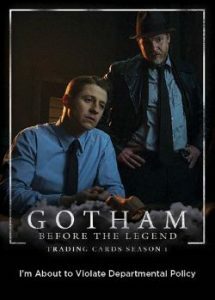 Among the Season 1 stars of Gotham are Ben McKenzie as James Gordon, Robin Lord Taylor as Oswald Cobblepot/Penguin, Jada Pinkett Smith as Fish Mooney, and Donal Logue as Harvey Bullock. 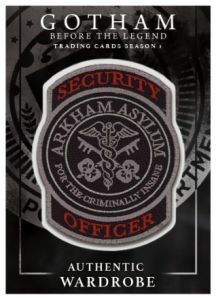 There are also standard insert sets in 2016 Cryptozoic Gotham Season 1 that should be easier to put together. 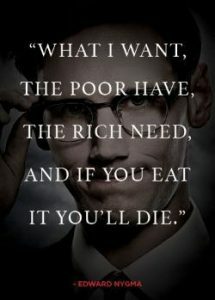 These include Character Bios, Quotes and Villains. 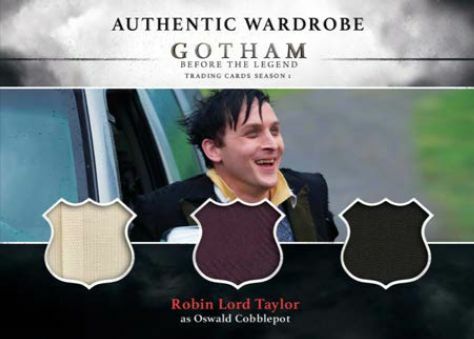 Sold separately, a custom binder is available with an exclusive wardrobe card. Fans can also scratch their collecting itch with a full line of Gotham Pop! figures. PARALLEL CARDS: Silver Foil Board*, Printing Plates - 1:174 packs. *Overall Odds (Base, Character Bios, Quotes, and Villains) - 1:3 packs. 02 Double homicide. Theater district. 13 Honey? Where’s Your Manners? 15 You Want Us to Fight for It? 28 Bloody Hell, What Happened to You? 51 You Let the Snake Loose? 53 My God, How Long Has It Been? 54 You’re the One Causing All the Fuss? 56 Nothing for the Invalid? 62 Anyone Know How to Fly a Helicopter? 63 Hello, Bruce. I’m Barbara Kean. 65 Riddle Man? The Hell You Doing Here? 66 Fun. That’s One Word for What Happened. 70 Fish! Where are you?